The fortune teller said I would find a mythical creature, and hear a great secret. Here was the creature. I held it up on the tips of my fingers. "Dragons are real," said the voice. There was a pause as I waited for the rest of it, then realized that was the rest of it. Apparently, the smoky little lizard's great secret was that it did, in fact, exist. "What, that's it?" I said, a little annoyed. "What do you mean, 'that's it?' I'm a flying, talking, firebreathing dragon! The stuff of legends, rising up from the age of mysticism!" 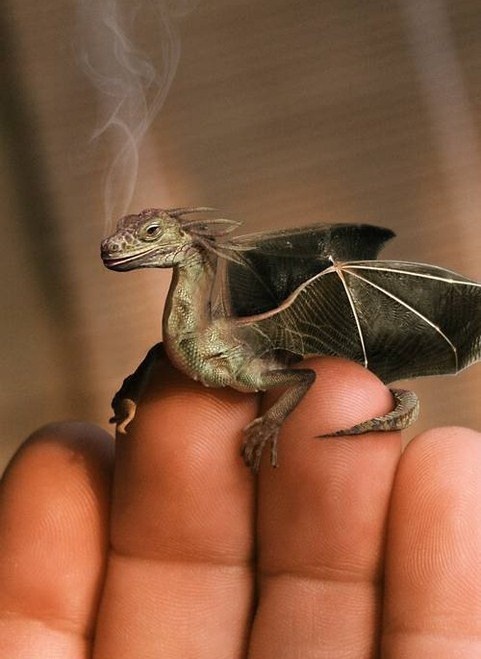 "You're the size of my thumb, and I have yet to see you fly or breath fire," I said. With a huff, the tiny reptile leapt off of my hand and onto the table. "Well," it said, "you certainly could have done worse. Before, you were minus one dragon and, by extension, one connection to a world filled with magic and wonder. Besides, it's not like I'm a fairy. Regular pests, those are." "Magic and wonder, nothing," I said. "If the rest of your 'magical world' is proportioned like you, what good is it?" "What good...?" the little beast said, confounded. "Yes, what good! Unless you can be converted into a hot water heater, or know a spell that'll find my keys when I lose them, what good are you?" "You're not even good for decoration. I can just see how it'd go if I told people I had a dragon. Oh really, let's see it then, they'd say. Right, here it is, I'd say. Wow, that's awfully small for a dragon, does it do anything, they'd say. Not really, I'd say. UNIMPRESSED, they'd say. So you tell me, if you're no good for dragon stuff and you're no good for anything else, what good are you?" After I'd finished my rant I looked down, but instead of seeing a slightly mutated reptile there were only some scorch marks on my table. Does the dragon story resonate with you? What would you do if you found this creature? I like the story very much, thanks. and what a great picture of the dragon. It's cute. Thank you El Ma! Brian McFarland is a genius and I hope to catch more of his work soon!